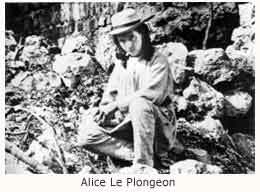 Three One–Act Plays About Augustus and Alice Le Plongeon. The three plays can be produced separately or together. The first two plays have a running time of 40 minutes and the third play is 30 minutes long. The basic structure of the set can be used for all three plays, though significant changes are required between the first and second plays. The cast size for the entire trilogy is 8. The set for this play is the living room of the Le Plongeon’s home in Brooklyn, New York; the time is 1895. Far from the hopes and challenges of their beloved Mayach, the Le Plongeons are at battle with museum officials and the conservative "authorized Americanists" of certain universities, who are either ignoring or condemning their work. The academic archaeologists are at odds with Augustus’s sweeping views of the Land of Mayach as the motherland of all ancient civilizations, including Atlantis, as well as with his esoteric archaeological interpretations. This play also takes place in the living room of the Brooklyn home. The year is 1910 and Alice has been a widow for a little over a year. Her friend, Maude, has planned a "fiesta" to cheer her on the eve of her departure for London, where Alice, unwell, plans to visit her family and draw up her will. Maude has invited two young friends from the Explorer’s Club to recite passages of verse from Alice’s own A Dream of Atlantis.